Mrs Heathen and I are suckers for prestige TV, and I love gangsters, so we dove into Boardwalk Empire when it started. 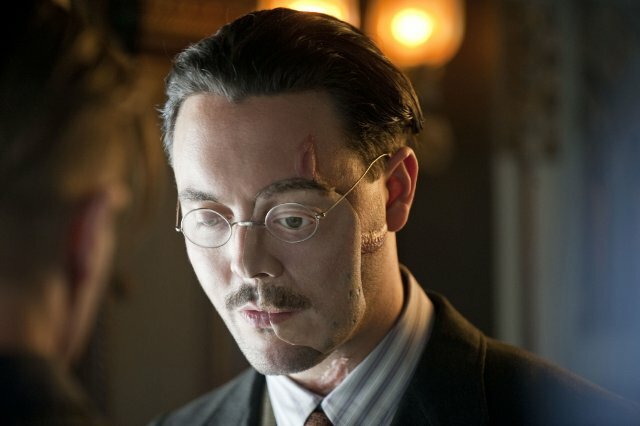 Unfortunately, it just didn’t hold us after the 2nd season — and frankly, we stayed longer than we might’ve otherwise, in part because of the incredible charisma that Jack Huston imparted to the tragic, disfigured Richard Harrow. The show concerned organized crime in Atlantic City in the years between World War I and the end of prohibition, more or less. The central character, played by Steve Buscemi, was based on a real person, though obviously they took liberties. Michael Pitt appeared as Jimmy Darmody, young man who’d run off to war and come back physically whole, but mentally shattered. Darmody befriends Harrow, and introduces him to the criminal underworld of Atlantic City — a role that, as it turns out, Harrow takes to like a duck to water. Anyway: it’s through Harrow that I first learned that, after the war, many who had facially disfiguring injuries were fitted with tin masks molded and painted to resemble their prewar faces. This morning, I was reminded of the show generally by this excellent photoset over at the Atlantic. Pay close attention to number 33. It’s Monday. Maybe you need this. Here’s the Tedeschi Trucks Band with Sharon Jones playing “Tell Mama” live in Vegas from June, 2015.